Here’s the best way to achieve your dreams: Don’t plan. Don’t even write your dreams or goals. Let them be somewhat undefined. That way you’ll never feel bad because you won’t know exactly what you didn’t achieve. But if you do plan goals, make them vague, non-measurable, non-actionable, irrealistic, and time undefined. Do not define the smaller steps to the main goals. That way you won’t be bothered with extra motivation for finding that you’re succeeding. There’s never need for extra motivation, because your discipline is legendary. By not defining a timeline, you can also wait for the perfect moment to come. A possibly never-coming future perfect moment is still better than the imperfect present moment. Today, might be the closest you’ll ever get to perfect moment, or the farthest. But since you don’t know, just lean back, be passive, and let the time pass by. Don’t work on your goals, that way you can enjoy life because you’re not tired. Imagine your life is a boat and you got sails. Don’t bother sailing that boat by yourself. Just let the wind blow and see where it takes you. Maybe you’ll go around in circles, maybe you’ll travel the world. What an adventure it can be! Maybe you’ll be happy without achieving your dreams. In fact, by the time you’re old enough to find out whether that’s true, if you recognize you should’ve achieved them, then you won’t have to suffer the pain of regret much longer anyway since you’re already near the end of your life. Yes, people at their deathbed definitely don’t look back and regret not doing the things they could’ve when they had the opportunity. Even if at the time, that opportunity wasn’t the perfect. Now that we got out of the way what not to do, let’s make it clear what to do. By planning I mean setting goals, having in mind things you’d like to achieve: to do, to have, to be. When you clearly define what you want, the steps needed to get there become remarkably clearer. 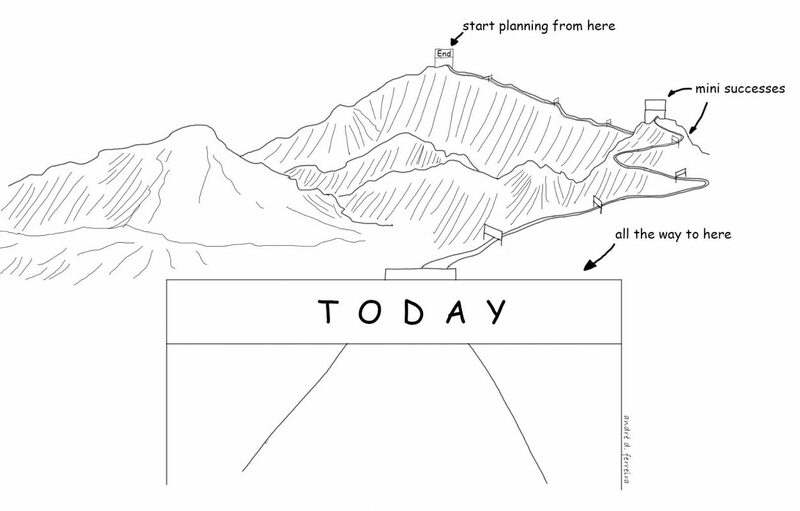 How to plan: Start from the end and progressively get to the present. And remember: a remarkable life doesn’t need to be what others think is remarkable. It’s *your* definition that matters. No one is going to die in your place. No one else will feel your regrets for you. So do yourself a favor, and try to clean your mind from the noise. When it’s calm and quiet, and only you there, write. How would you like to be remembered? What would you like people to say about you when you’re no longer here? What kind of mark would you like to leave in the world? A good long-term goal time frame is ten years. It seems like a really long time. But ask anyone how fast the last ten years passed by and most will complain they seemed like an instant. Imagine what your life could be and look like if you could do anything you wanted without any fear of failure. Let’s say it’s 10 years from now. What kind of house are you in? Are you in the city? What does your furniture look like? Your car? Your career? How are you fulfilled professionally? Do you work for someone? Do you work for yourself? What is your day like? What is your health like? Who are you with? Who are your friends? Write this whole day. What it looks like. 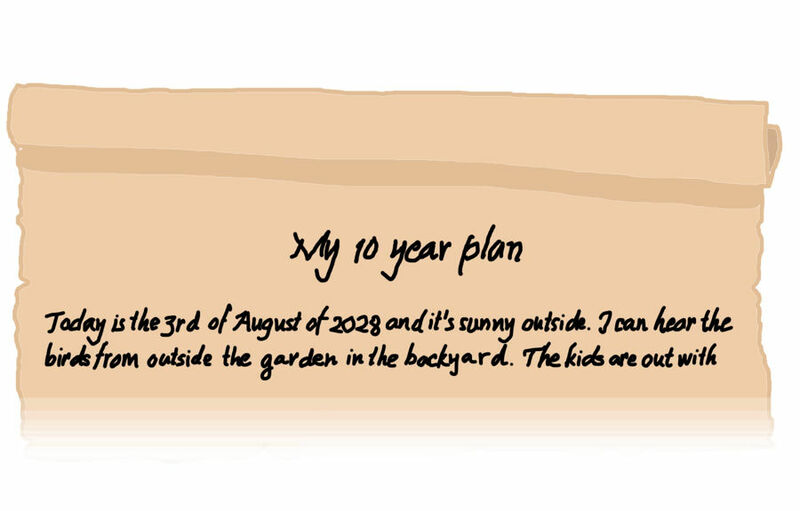 On this day, 10 years from now. Dream big. Dream without any fear. Put your whole heart into it. Write like your life depends on it, because it does. Write the things that, if this here was your best life, you could achieve. If this here, out of all universes, was the one where you are the most happiest and successful (by your standards) what would it look like it the future? Writing doesn’t hurt, and there’s no one to look at it, so go all out. Finished? Now write another(s) potential dreamy day(s). We can do several things in different stages of our lives. Hence it is OK to write several potential awesome lives. We might get to live more than one at different stages. Doesn’t it feel better to suddenly have a guiding star? Read these papers once in a while and check how you’re doing. But… but we change. The world changes. How can we know what we will like in 10 years? Look back 10 years. How have you changed? How has the world changed? Do you still enjoy the same things, have the same values, would value the same goals? What if in 10 years your plans don’t even make sense? And how can you plan based on your limited experiences? Let’s say that in a parallel universe you experienced all the things in the world, and in that universe you reached the conclusion that what you want the most is to be a pianist. But in this world, how can you know that if you’ve never even tried a playing a piano? What if planning results in we becoming too focused on achieving this one plan, which might not be the one that would make us the happiest? Maybe by not planning, by letting the wind randomly guide us, we would have discovered something else that made us happier. This is where the next point comes. This should be a goal of yours in by itself. We live a great part of our lives in echo chambers, surrounded by the same thinking. You can’t be what you can’t see. And because we have not had certain experiences, we can only try to fit ourselves in the boxes that we know. But maybe, those aren’t the right ones for us. Trying new things include meeting new people. Meeting people that have different jobs than you have, that have vastly different life experiences. But do not just think about the end result of those people’s lives. Don’t just see an entrepreneur and think you want to have the same that he has. Observe their work ethic, their day to day life. Do I want that process? Do I want the annoying attachments that come with that lifestyle? Because that’s where you’re going to spend 90% of your time on. I feel it is necessary to introduce what might be the ultimate goal, because in the end, this might be the thing or one of the things we all strive for: Happiness. A word that means so much, yet is thrown around so much it loses its meaning. What is it? Joy, feeling content. That the purpose of life is to enjoy it. Health and Time are the two most important parts of your life. Without health neither money nor relationships can be both easily earned or maintained. If your health declines rapidly your money goes to fixing it and your relationships will falter. Without health, time cannot be enjoyed. But without time, no amount of health can provide an actual life. Without time to do what you really want, you don’t actually live, but merely exist. Someone who spends their time being told what to do, is like a mouse told to run in circles for its whole existence. A mouse half its age that has circled the world has lived much more. Are you moving directly towards your goals? Or are you move more or less in their direction but not really? Are your actions moving as straight as possible to your goals or just resulting in marginal effects? Or are they just big enough so you can convince yourself you’re working towards them, but we both know that’s true? Most people that I know that are doing this, are in fact being thrown around by life, but they deceive themselves by saying it is a conscious choice, part of their plan, which, when asked to be presented, is vague and clearly not well thought out. If happiness is one of your goals, then keep reading, otherwise just skip to the next chapter. Savor the little moments in the present that bring you joy. The soft sound of rain drops on the window. The taste of that ice cream on the beach listening to the breaking of the waves and the calming heat of the sun on your skin. A tickle fight with your special one. Take a moment to appreciate your friends when you’re with them the next time. Take a moment to enjoy the smell and feel of clean sheets. The feel of grass in your feet when you walk over it barefoot. The sound of rustling of leaves when you go do an errand. Savoring = happiness acknowledgement. Many (most?) times we are happy, we aren’t conscious of it. By acknowledging we are happy, it increases the feeling of happiness itself because it adds an extra layer of “this is special, let me cherish it”. One time I was with my girlfriend on a paradisiac place and I told her: “Remember this moment now, because in the future when you look back you’ll think it was a beautiful dream”. And it was. And it makes me so happy that we were able to acknowledge that then, and cherish it for how special it was. Be grateful for the good little things that you already have and that happen to you everyday which you take for granted. After we get a spike of happiness from a new purchase or life improvement, it takes about 3 months for the level of happiness to back to what it was previously. Feeling grateful is a way to re-ignite these little happiness spikes that have been extinguished with the passage of time. Be grateful that you are conscious, alive and can experience this world. Out of thousands of millions of unborn ghosts, it is you and I in our ordinariness that are here in this fleeting moment. Be grateful for that. Be grateful for the food that you eat, for your body working marvelously just for you, for the little things that go right. The elevator could’ve crashed. You could’ve had an accident. A friend of yours might have died. There could be war in your country. Aspire for a better future, for things that you want to achieve. If you can’t imagine an improved future, you won’t be happy no matter how well your life is going right now. One of the hallmarks of depression is lack of optimist about the future. It’s thinking that it won’t improve, it will be always like this, or not much better. Fight that state of mind rationally. Find reasons and things you could do that would increase the likelihood of your future improving and you being excited about it. Give, share, and think about others. Adults are starved for kind words and concern. When you understand the power of honest praise (as opposed to bullshitting, flattery, and sucking up), you realize that withholding it borders on immoral. Though the more you give, the more you have, sometimes, to give, you need to have. A person that has never been loved will feel hard to love. So be kind to yourself. A technique that is frequently used in psychotherapy is this: Image you have a son and you love that son no matter what. You want only the best for him. And you hear that son blaming himself, feeling down with the weight of life, being caught in anger. What would you tell that son? Would you say “Hey, everybody makes mistakes. It’s going to be OK.” But do you even do that with yourself? One are the summaries of A LOT of papers on the science of happiness. Kudos to Happify for the work they put in there. Read a few of the summaries and you’ll start to see patterns. Two is a course on happiness. Yeah right? Who would guess we would need to take a course to learn how to be happy… but I recommend it because it is very well put. In fact I may try to put my course notes in here later on, they have definitely made an impact on me. Start working on those 5 most important goals, but chose one to be your main project. And don’t spend a minute working on the next 20 things. It splits your focus, and we humans aren’t good multitaskers. And remember: the more you hesitate…the less time you’ll have to actually execute on your dreams. So here’s my advice. If you’re holding back from jumping on an opportunity… because you want the conditions to be “perfect”… Guess what? The timing will NEVER be perfect. After you have written your plan(s) and you are putting into them the necessary actions, there is still an oversight to be had. You will not be able to achieve them if you display the wrong attitude. And part of that is the way you define success. Do not to define success as attaining major goals, but each step you successfully take in the right direction. Each day that you do just one thing that makes you closer to the final goal, is a successful day. Each day that you improve marginally is a success. Each day that you become better than you were yesterday is a successful day. “Today I managed to do (small thing). I am having success.” Feel good. Not only will you also enjoy the process more, but you will feel more confident about being capable of doing this. A flame that burns with double the intensity, extinguishes in half the time. Do not feed on motivation alone to keep your goals alive, feed on discipline. Do one thing each day or each week that moves you forward. And if you find that difficult, decrease the difficulty and effort until you can. If you cannot summon will to do it, then you need to reassess if you want that goal that badly, because it seems like you don’t. In that case you might want to see if there are other things that you want more, and which make you excited just thinking about the possibility of having them. Then redo the planning. Now, go on, write and act like your life depends on it, because it does. This entry was posted in Doing and tagged Planning.